Streamlined order fulfillment that saves you time and money, so you can focus on building your business. Increase your fulfillment efficiency across all sales channels with SellerActive. Our platform consolidates all of your orders, from every channel you sell on, into a single location. Fulfill orders, choose shipping options, and communicate with customers instantly and painlessly. Our integrated partners provide sellers with a multitude of shipping options, so you can choose the right technology for your business and get orders out the door as soon as they come in. Design a packing slip template and brand it with your logo, and we’ll fill in the necessary information and print each time you mark an order fulfilled. Seamlessly manage your Fulfilled by Amazon orders and inventory with our full-feature FBA integration. Once you start making sales, how do you avoid spending all your time micromanaging inventory and orders? With SellerActive, Gavin was able to streamline 2 Wheel's order and inventory management process, implement new tools, and eliminate the frustration and inefficiencies in a non-optimized business system. The change allowed him to concentrate on growing his business, rather than troubleshooting problems. Gavin’s results speak for themselves: 2 Wheel experienced an average of 43% growth in monthly sales in the first few months of becoming a SellerActive customer. 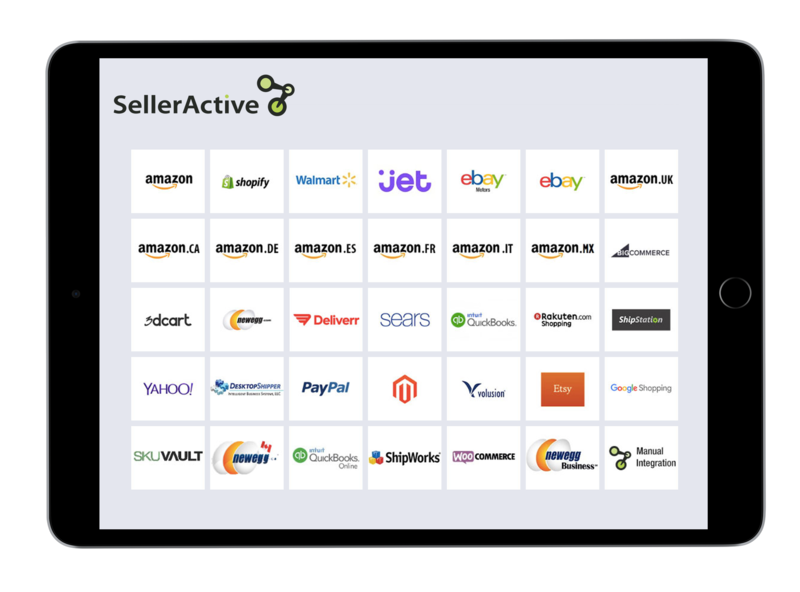 The SellerActive platform works with virtually every major e-commerce marketplace and shopping cart to provide sellers with a seamless order workflow from order creation to fulfillment. It takes just minutes to set up your integrations. Once you're connected, we'll automatically import all of your existing orders into SellerActive. With SellerActive, your inventory is no longer shackled to a particular e-commerce channel. Satisfy more customers and boost operational efficiency with listings and orders synchronized between eBay, Amazon, Jet, Walmart, and other major marketplaces. Fulfill your orders through third parties? No problem. Our built-in tools allow you to streamline your dropshipping processes for maximum efficiency. SellerActive allows you to organize your dropshippers into groups, so you can add and coordinate locations and vendors. Export your results by vendor for clean and easy order management. Keep track of orders, generate lists of products as needed, and then export reports to their designated vendors. When it comes to shipping packages, you need to know when, where, and how much. SellerActive users save hours of time every week by effectively automating every part of the fulfillment process. Money saved on shipping can add up fast. Our shipping partners will automatically find you the best deal by comparing real-time shipping rates from all the major carriers: USPS, FedEx, UPS, DHL, and more. There’s no need to go through your orders one by one. Save time by printing shipping labels for your pending orders in batches. 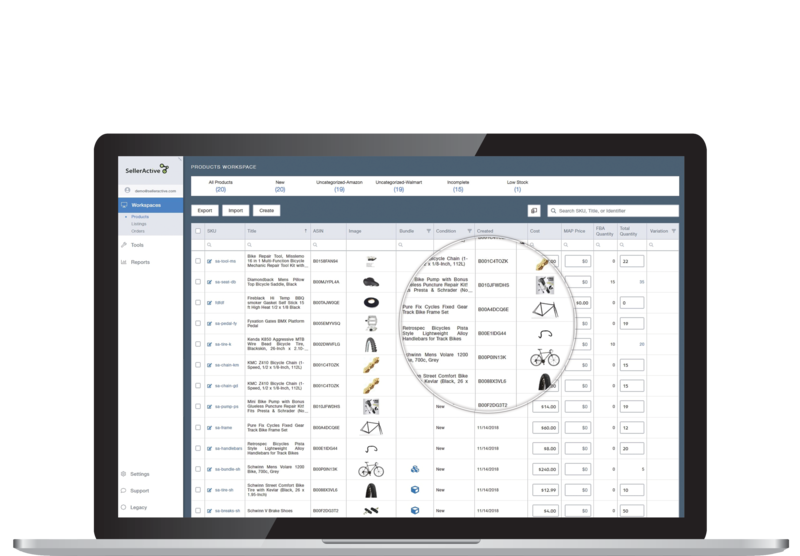 "SellerActive is a Great Tool for Keeping Track of Inventory"
"The ability to sync multiple accounts to this software makes things so much easier as far as inventory management goes. The ability to allocate quantities across multiple stores is extremely useful and helps prevent overselling."